It is winter time in Chicago. The temperature hovers in the teens, or lower for days on end. The streets are icy, snowy, slushy, lousy. The wind blows frigid and raw. Lips are chapped, toes are numb. Cars may not start and the CTA may be more f'd up than when the weather is kinder. Due to these insane conditions we've all put our bicycles away until the lambs of March emerge from hiding. . . Right? Well, no. Lots and lots of folks here in Chi-town ride in the the winter. We ride to work, along the lake front and to the store. Some even do their holiday shopping by bike. But in my experience many, perhaps most, drivers tend to think bicycles disappear with the nice weather. This means that they are less liking to expect you to be out on the road when the weather is bad. This creates a dangerous situation for the winter cyclist. Some years ago I represented the family of a man who was struck and killed by a motorist in December. At the time, it was very cold, but sunny and dry. The man was riding in plain sight. There was little apparent reason for the driver not to have seen him. 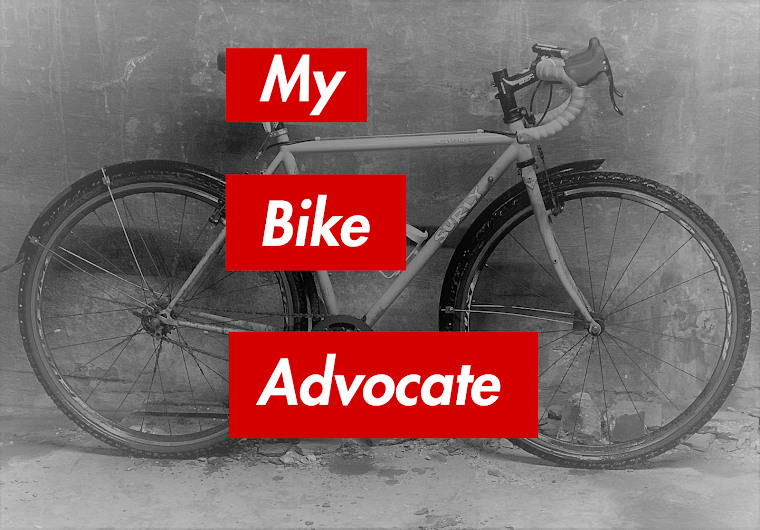 When I took the driver's deposition during the course of litigation one of her excuses for not having seen him was that she did not expect anyone to be out riding their bicycle in December. It's a stupid excuse, but illustrative of an attitude of which winter bicyclists should be aware. When you ride during the winter -- and, damn it, you should -- make an extra effort to be visible. Use bright, blinking lights on the front (white) and back (red) of your bike, even during the day. The gray, dreary skys that prevail through the Chicago winter tend to make you blend into the landscape, and that's a bad thing. Wear bright colors. Use that florescent ski jacket you bought back in '86 when you ride. Adorn your bike and your person with reflective tape. Also, do not be afraid to take the lane. Do not feel that you must ride in the slush and filth along the side of the road. Doing so is dangerous and unnecessary. Illinois law permits riding in the "regular" traffic lane when riding along the right side of the roadway is dangerous. As the good folks over at Bike Winter point out, "If someone is honking behind, that's a good sign. At least they see you." Finally, be extra cautious in trying to avoid acting unpredictably. For example, salmoning, always a bad idea, is especially so in the winter. Remember, motorists do not expect you to be out riding at all in the winter, let alone riding the wrong way down a one way street. Keep riding. Breath the frosty air, and be seen. Oh Those Inconsiderate Bicyclists. . .